As there is an increased awareness of the importance of exercise in health , there has been a big increase in the number of people attending sports activities. This has led to an expansion of new sports facilities around the country by Local Authorities , part of Government funded schools as well as private chains and is encouraged by National Government policies promoting healthy living. Sports buildings such as sports halls and gymnasiums are large open spaces built to withstand years of use (abuse !) for a variety of sports. They are built normally with hard solid walls, hard floors and hard ceilings surfaces which makes them particularly difficult to use due to the terrible acoustics in the hall. These spaces are often used (especially in schools) for a variety of different activities. Therefore the acoustics in the halls needs to designed carefully from the design stage to ensure that problems with acoustics are minimized. Reduction is reverberation noise is paramount so that noise levels are reduced to facilitate clear communications and provide an enjoyable atmosphere whether the activity is a school assembly hall use or for one of the many sports which are carried out in such halls. Sports England and Scotland requires that certain acoustic requirements are met in sports halls. 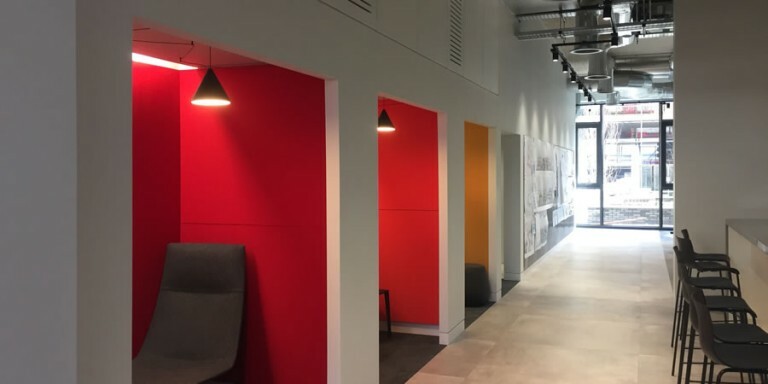 Health & Safety research and concerns by the Education authorities into schools has resulted in the introduction of legislation to comply with the acoustic requirements. These are laid out in Building Bulletin BB93 and are part of the Building Regulations. Sports halls, gymnasiums and swimming pools have long reverberation times because of the nature of their construction and surfaces necessary to their function. One of the of the prime requirements of the internal surfaces of sports facilities is that they are strong and durable. To this end , the internal wall surfaces typically comprise of painted high density block work , brickwork or timber cladding. The floors are invariably timber sprung to allow a variety of sports activities such as indoor football, badminton, aerobics , etc. 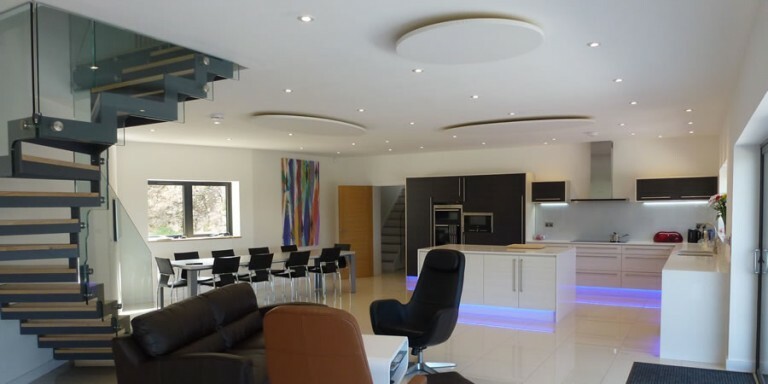 The ceilings are generally metal cladding, concrete, plasterboard or solid timber. All these are hard surfaces. When sound hits these hard surfaces, it bounces back into hall and this results in high noise levels and poor speech intelliagibity. Soundsorba have a range of acoustic panels which will deaden the hall. In general these products are used at high level (generally above 3 metres) on walls and ceiling surfaces. To ensure that the acoustic performance standards are met, it is recommended that the designer or builder contacts Soundsorba for technical advice at an early stage. Soundsorba can provide design calculations in order to specify the correct solution for that particular building construction. We can assess and analyse the existing acoustic environment in the hall and devise the most cost effective remedial acoustic treatment scheme to make the hall comply with the relevant acoustic standard. These are high performance Class A acoustic absorbers in only 40mm thickness and are available in a huge range of different colours. They are lightweight and can be cut to fit walls on site to suit the building dimensions. Standard sizes are available as well as bespoke sizes. These are really high impact resistant panels manufactured from MDF boards and machined to give its acoustic properties. They come in a variety of wood veneer finishes such as Oak, Beech, Cherry, etc. Painted finishes such as white and grey are also available. Woodsorba timber acoustic panels have been tested against ball throwing according to European DIN standards for sports halls for gymnastics and games as well as multi purpose use. These are impact resistant from indoor footballs, etc. The standard stock colours are white and beige. However, any RAL or BS colour can be ordered depending on quantity. These robust acoustic panels are made from natural wood fibres from 100% sustainable sources. Their robustness along with multi colours, makes them ideal for reducing reverberant noise levels in sports halls and gymnasiums. 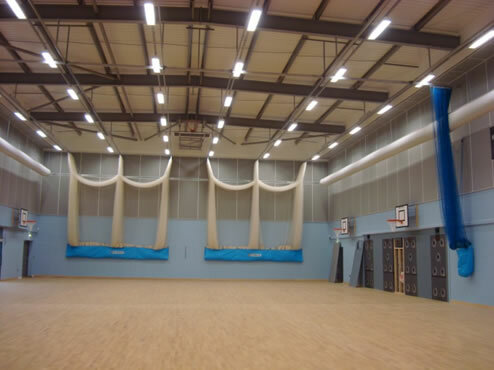 Soundsorba offer a free acoustic advice service including assessing the acoustics in your new or existing sports hall or gymnasium and advising of the best solution to improve the acoustics to the level required to make the hall acoustically usable.